A naïve undergraduate is transported from a small California town to the intensely competitive world of Capitol Hill policymaking. Gerald Felix Warburg’s memoir is not just a story about four decades in Washington, although a life spent as a House of Representatives and Senate staffer, and as a lobbyist and professor, provides remarkable insight into the struggles, the strategies, and the people of the U.S. capital. At heart, it’s an unfailingly optimistic call to public service, and that is what will make Dispatches from the Eastern Front a standard for the study of real-world political science for years to come. 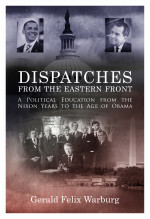 Visit DispatchesMemoir.com for more information.